Dispatched to France in September 1939, the ten infantry divisions of the British Expeditionary Force pressed forward into Belgium eight months later to meet the onrushing German panzer divisions. Faced with overwhelming odds, the British gave ground slowly as they fell back toward the English Channel, finally exiting the Continent through the miraculous evacuation at Dunkirk. Road to Dunkirk is a complete Panzer Grenadier game based on the epic battles waged by the British Expeditionary Force against the Germans in the spring and early summer of 1940. There are 47 scenarios based on these battles, organized into six “battle games” that allow you to play the scenarios in sequence toward your army’s operational goals. Scenario design is by Philippe Léonard, who designed our Panzer Grenadier: 1940 The Fall of France game. Road to Dunkirk includes 517 die-cut and silky-smooth playing pieces. There are eight heavy cardstock maps with artwork by Guy Riessen so they match up nicely with those from 1940: The Fall of France. 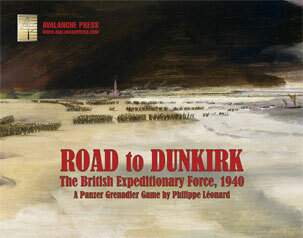 Click here to order Road to Dunkirk right now.